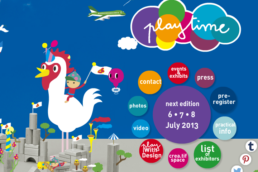 Time to book the plane and train tickets for Playtime Paris, due on January 31 to February 2 at Parc Floral de Paris. 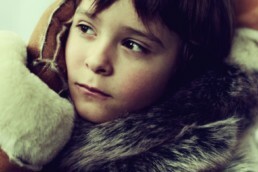 The show will welcome 440 international brands around children’s fashion/decor and maternity. Here’s a quick preview of this 17th edition, the largest since the creation of the show in 2006. For Playtime, growth does not equals dilution : the brand assortment is just as selective, complete and easy-to-read, focusing on the best collections of the moment in an inspiring and convivial work setting. Below is a little suggestion of names to help new comers in the children’s wear market. For lovely layette with a twist (much more interesting than the usual pink and blue…) : ketiketa, tocoto vintage, kidscase, esencia, aden + anais, noch mini. For gorgeous room decor and toys : nobodinoz, oeuf, donna wilson, deuz, chispum, esthex. 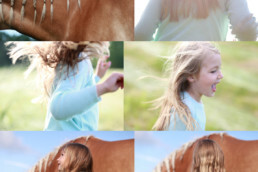 For super cool, sweet outfits and accessories : atsuyo et akiko, noé & zoë berlin, april showers by polder, numero 74. For colourful, modern silhouettes : bellerose, imps&elfs, maan, simple kids, ten, hartford, ao \ american outfitters, morley, gold, milk and biscuits, rita co rita. For the elegant & chic brands : caramel baby & child, marie-chantal, tuchinda, hucklebones, max&lola, paade mode. For teenage girls : mono, soeur. For gorgeous knits : aymara, marmar, fanny belette. For a pop-rock/artsy/surf touch : no added sugar, bobo choses, munster kids, abc123me, loud apparel, shampoodle, wolf & rita, apunktchen, bang bang copenhagen, caroline bosmans, motoreta, mini rod ini, yporque. For the best of organics/handmade/ethnic : macarons, hbb industry argentina, hilda henri, maravilla, serendipity organics. 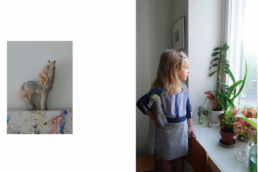 For the best shoes : pèpè, nathalie verlinden, chapter2kids, young soles. 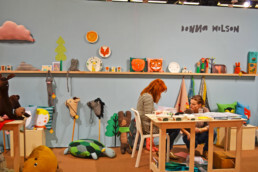 Also not to be missed : waddler, velveteen, violeta e ferderico, bob & blossom, talc, braveling, d.j.m studio, chat merchant, le petit lucas du tertre, je suis en cp!, soft gallery, anaïs & i, moon et miel, boys&girls, little creative factory, blune paris, indikidual, soft gallery, louise misha, louis louise, nadadelazos. Buyers traveling a long way will appreciate the massage area (nothing best to erase the jet lag effects!) and people who look after their health will be happy with the organic + homemade food by Soup Juice. (Massage area near the fair’s operations office – by appointment). At the fair entrance, Playtime team will be wearing a lovely new uniform designed exclusively for us by Kaatje Sandra, designer of the Belgian brand Max & Lola. I will be posting more on new brands…stay tuned and enjoy your visit! Organic clothing line for babies NOCH mini was founded in 2010 by designer Jina Jang. The label, based in New York, will be showing at Playtime Paris (July 5, 6, 7).